JNN 23 Feb 2014 Sanaa : Yemeni anti-government protesters have held demonstrations in the capital, Sana’a, accusing the president of failing to deliver on his promise for change. According to Press TV, chanting anti-government slogans, demonstrators took to the streets of the capital on Friday. They also called for the release of those detained during the 2011 uprising as well as the prosecution of officials involved in the killing of hundreds of protesters. 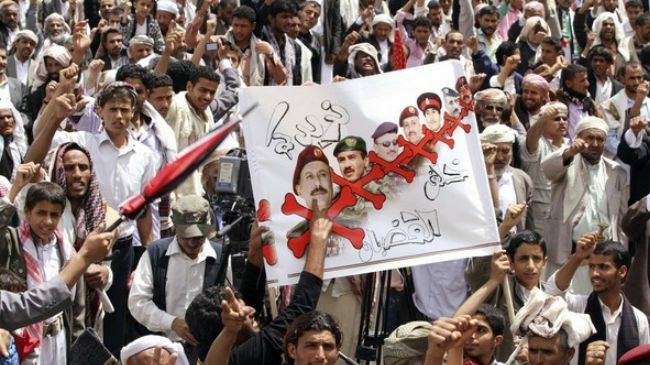 Demonstrators also demanded a shake-up in the ranks of the army, which they believe is still home to the remnants of the regime of former president Ali Abdullah Saleh. Yemen’s Houthi protesters also held a demonstration in the capital, calling on the government to step down. This entry was posted in Middle East and tagged Ali Abdullah Saleh, demonstrations, Government, Press TV, Protesters. Bookmark the permalink.